Boston. I actually wrote this a few weeks ago, sort of as a backup in case I was too busy to write anything else. Truth be told, I’m not a fan of Boston. Of course, there are some great things in Boston. 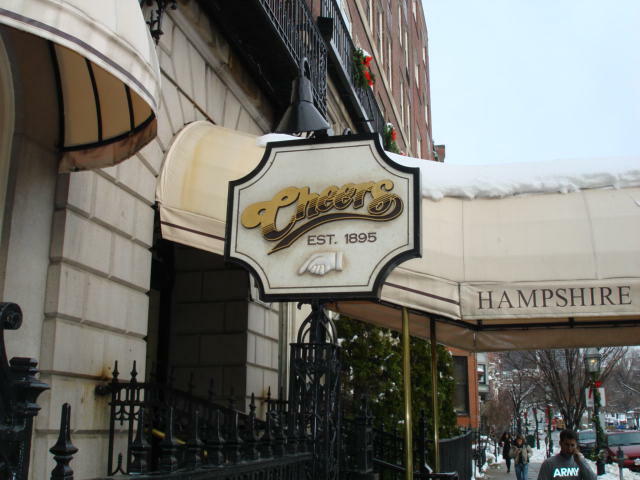 Obviously, you need to go to Cheers at least once in your life. The water is beautiful (and cold). And you can take a whale watching trip out in to the Atlantic and see some spectacular whales. Just don’t go during a storm or you will spend the day puking off the side of the boat. Just ask my 5th grade class. And there is some great shopping. I got a lot of Christmas shopping done there. But the people are loud. And they talk funny. I mean, why can you say an R if it’s at the beginning of the sentence, but not at the end? , And we all know the Patriots are cheaters. (Just remember, I’m a Bills fan). And did the city planners purposely make the roads so hard to navigate because they wanted you to just give up trying to leave and stay? But now my thoughts, as illogical as the lack of an R and mostly sports-based, have been taken from me. The horrible tragedy in Boston has taken more than lives. It has changed lives. It has taken our sense of security, and our denial as Americans of what a lot of the rest of the world has to deal with everyday. Our thoughts have changed; our adjectives have changed. Just as you cannot think of NYC without thinking of September 11th, you will now think of Boston and the bombing of the marathon. You will no longer go for a run without thinking of how awful it must have been to feel that bomb explode while running the marathon. It will no longer be “Cold Boston” or “Huge marathon.” For weeks, and months to come, we will be a little more vigilant when at sporting events, or concerts, or any where there is a crowd. And for most of the country, as time passes, we will go back to normal. But not for the lovely, loud Bostonians with the speech impediment. This animated city, full of friendliness and charm, has been shrouded with a solemn cloak of disbelief. Whom ever is responsible for this loss of life, denial, and adjectives has taken the everyday ignorance that American’s are so lucky and blessed to have. My thoughts and prayers are with you Boston.